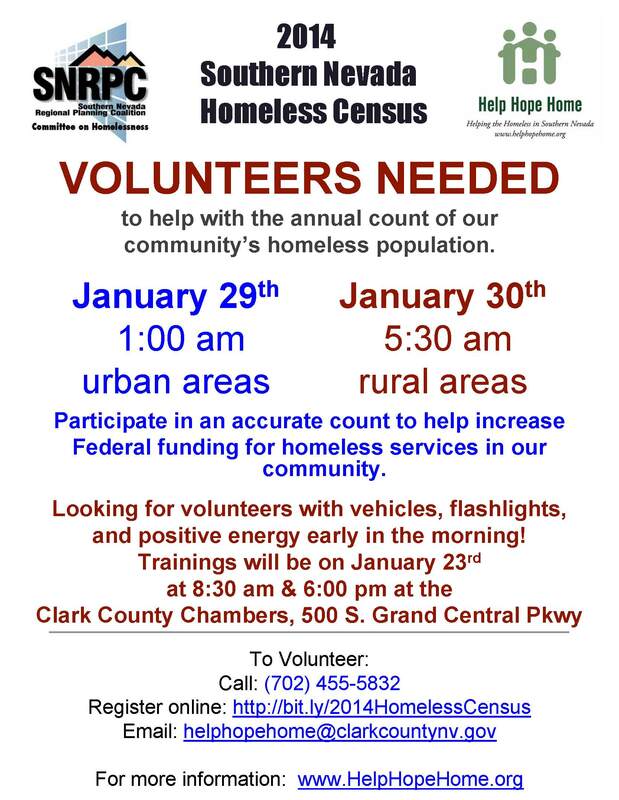 Be a part of a regional response to homelessness, by volunteering with the 2014 Homeless Census occurring on January 29th during the early morning hours. This opportunity takes place from 1:00a.m.-6:00a.m. Volunteers will report to one of five deployment stations across the Las Vegas Valley by 1:00a.m. Training for volunteers will be on January 23rd at 8:30am and 6:00pm at the Clark County Chambers, 500 S. Grand Central Parkway. Since there are multiple locations for this opportunity, please note the opportunity title and the zipcode to select the area in which you’d like to serve. Need assistance signing up as an individual or a team? Click here to access a tutorial. The census is a point-in-time count performed to assess the number of homeless living in the region. An accurate count allows funders and service providers to determine the types and level of services needed. Volunteers will travel into our census tracts and perform a visual count of our homeless population. Volunteers with cars and flashlights are needed. Training will be provided just prior to volunteering. There are two volunteer duties: 1) Drivers (must have a car), who will drive around the census tract with a partner volunteer to gain accurate counts and 2) Walkers, who will walk in pairs through the census tract and perform a visual count. Youth ages 14-17 may volunteer if accompanied by an adult. View the Volunteer FAQs here. 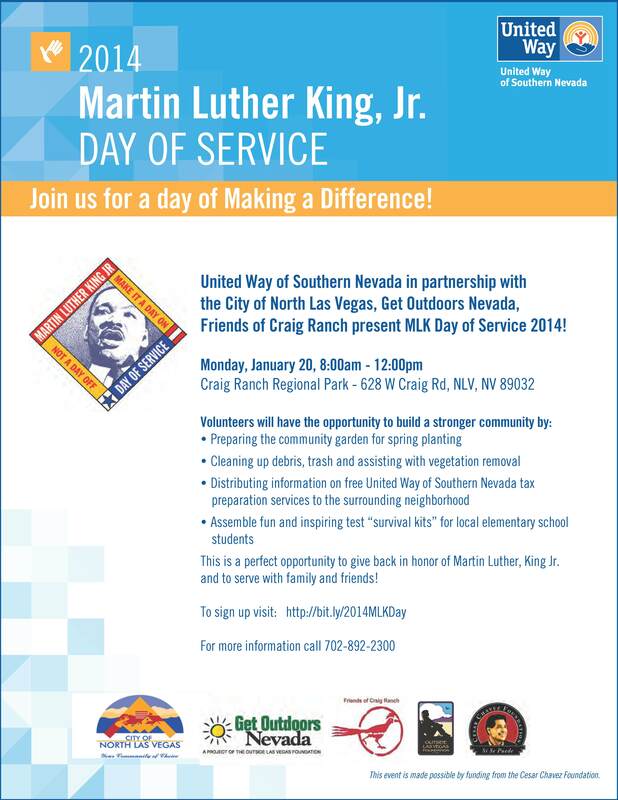 United Way of Southern Nevada in partnership with the City of North Las Vegas, Get Outdoors Nevada, Friends of Craig Ranch, and the Outside Las Vegas Foundation present MLK Day of Service 2014. Join us on Monday January 20th from 8:00 am to 12:00pm at Craig Ranch Regional Park. This is a perfect opportunity to give back in honor of Martin Luther King Jr and to serve with family and friends. 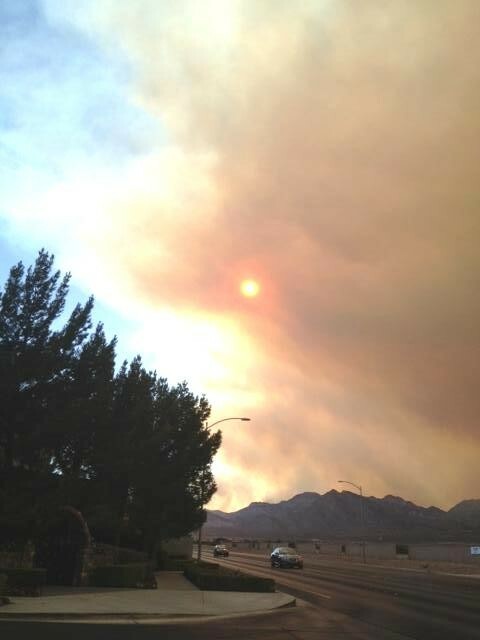 United Way of Southern Nevada continues to closely monitor the fire on Mt. Charleston. Click here to get up to date information for updates on the efforts on the Mountain. Click here to register your name for any future volunteer projects that may arise as a result of the fire. By registering, you will receive periodic updates on the status of volunteer projects and information on how you can help. At this time, experts have not identified any specific needs for volunteers however this could change in the near future. In order to allow the emergency personnel to safely respond to the fire, please do not go to the scene of the fire. The United Way of Southern Nevada, in partnership with the City of Las Vegas, is organizing a Downtown Clean-Up on Saturday, June 8th and we need your help! We will be kicking off the event at the Historic 5th Street School at 8:30am. Join us for a morning of painting curbs and hydrants, picking up trash, pulling weeds, painting murals, picking up litter, and other activities! This is a great opportunity for families and groups to come together, volunteer, and show their community pride! Check out the Event Flyer! Want more information? Contact Riley Foley at rileyf@uwsn.org. You can sign up for the opportunity on the Volunteer Center website. Make summer memorable for you and a special child! With the help of the community, every summer Torino Foundation provides camp programs for hundreds of children with special needs. This year, there are even more children that could benefit from the healing and personal growth that happens by going to camp. Whether they are critically ill or living with a life altering condition, all children deserve the opportunity to feel normal. Camps are available throughout the summer, so be sure to check out all the amazing opportunities to volunteer. Camp time commitment for counselors is: 1-day training in Las Vegas prior to camp start date, 4-day/3-night (camping) commitment. Commitment for activity specialists is 1 – 4 Days depending on the activity. Program for children with Autism. Program for blind/visually impaired individuals. Program for children at risk of heart disease. A Nevada Childhood Cancer Foundation program for critically ill children. Program for mothers and children affected by domestic violence. Click here to download the Volunteer Application. If you have questions or need additional information contact volunteers@torinofoundation.org. Completed applications can be emailed to volunteers@torinofoundation.org, faxed to 702-258-6040, or mailed to the Torino Foundation office at 4455 Wagon Trail Ave, Las Vegas, NV 89118. (originals are not necessary). Together We Can Make 2013 AMAZING! Looking for a great way to give back this summer? Look no further! 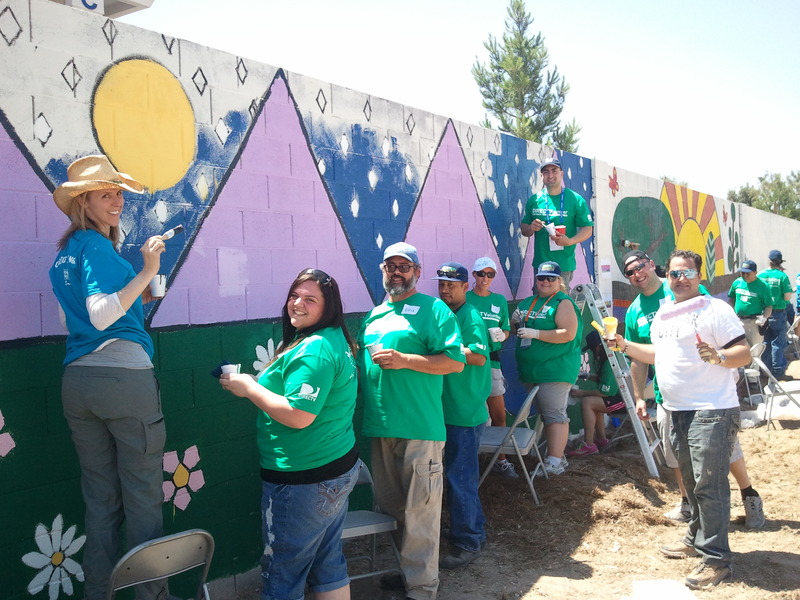 United Way of Southern Nevada has just posted a number of exciting AmeriCorps positions with four local nonprofits that will give you the opportunity to make a big difference this summer. These national service positions are volunteer-based, but each offers a living stipend and education award that can be used toward future educational expenses or paying back student loans. Check out these fantastic opportunities and click on the link to apply for any/all of the opportunities that are of interest. 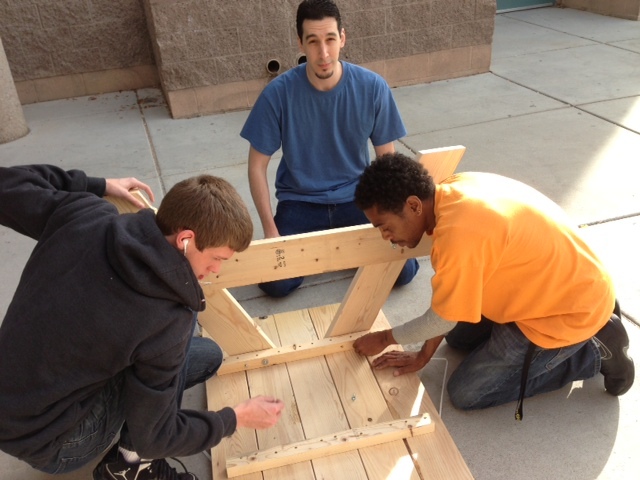 Questions about VISTA positions can be directed to Jacob Murdock at jacobm@uwsn.org or 702-892-2321. Questions about the AmeriCorps State position can be directed to Erick Ramirez at erickr@uwsn.org or 702-892-2351. Family Connect is a community-wide event that is held each spring to help connect low-income or struggling families with much-needed services. Booths will offer services and information in the areas of health, job readiness, food resources, child care and summer programs, financial planning, and legal guidance. This event is a great opportunity to serve the hardworking families of Southern Nevada! Volunteers are needed to help support the success of this event! During the event, volunteer duties will vary, but include escorting clients between services, checking clients in and out of the event, and helping with giveaways. Can’t stay for the whole event? Volunteer as part of the set-up team prior to the event! Click here to sign up for this great volunteer opportunity!